The Incom T-65 X-wing starfighter was the main all-purpose starfighter of the Rebel Alliance and its successor governments. Known for its versatility and good combat performance, it was a favorite with Rebel and New Republic pilots. Possessing deflector shields, a hyperdrive, an R2 astromech for repairs and navigation, and a complement of proton torpedoes, the X-wing allowed the Rebellion to launch raids in Imperial space with improved odds of a successful mission. The X-wing has played a major role since its introduction in the Galactic Civil War shortly after its capture on Fresia and through the aid of its designers. It was most heralded as the fighter that destroyed the Death Star at the hands of young farmboy Luke Skywalker. Later in the war, it defended Alliance ships and led attacks on Imperial vessels and installations. Pilots of Rogue Squadron favored using the multi-role X-wing fighter, flying it as often as they could on most missions; they only employed other craft for highly specialized missions, such as missions that required ion cannons. The X-wing was so predominately flown by Rebel and New Republic forces that it became a symbol of their faction, much like the TIE fighter and Star Destroyer were symbols of the Galactic Empire. Eventually, the T-65 model was outclassed by later, more up-to-date units. 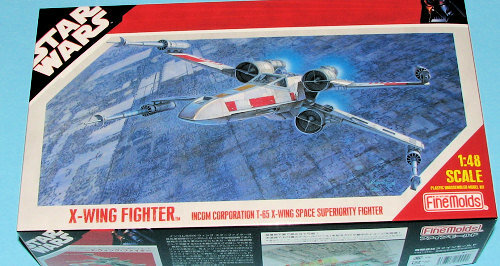 However, even with the inflow of new starfighters to the New Republic's arsenal, the T-65 X-wing was still in service. 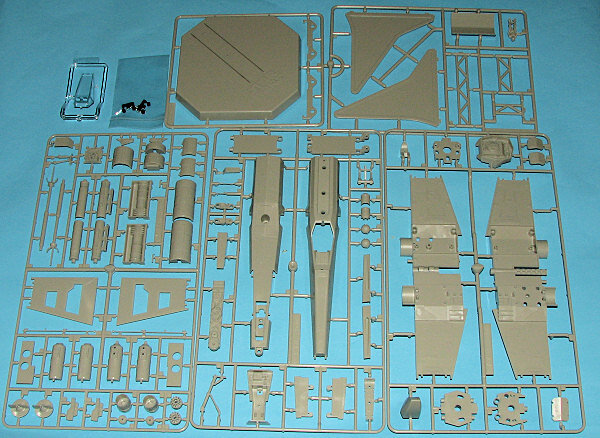 Fine Molds has been gaining quite a reputation amongst the sci-fi modelers for producing accurate and good fitting kits. This is especially true of their recent 1/72 Star Wars offerings, which are definitely world class. Much of this comes from having access to the models used in production of the various Star Wars movies, ensuring that one gets the most accurate representation possible. This is, to my knowledge, their first foray into producing 1/48 kits from the movies. The most logical choice is the famed X-wing fighter as flown by the hero in the final action sequence of the movie. 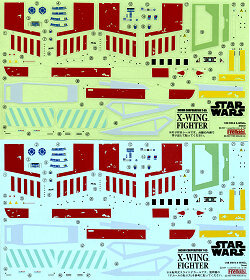 The kit contains four major sprues for the X-wing itself (the lower left sprue is duplicated and not shown), two for the stand and one for the very clear canopy. The molding is superb with nary a hint of nasty molding glitches aside from a bit of flash on the feet of the pilot, and a tiny depression on one of the thicker pieces. As this is a snap kit (! ), there are poly caps and screws to help with assembly. I know that to many, snap kits are an anathema and seen as only good for quirky and ill-fitting models for children. Well, I think that you'll change your mind when you have a look at this one. The benefit of this sort of construction is positive alignment and the ability to change things around. For example, this kit provides the ability to switch from gear up to lowered gear at will. You can also have the wings open or closed, and the display stand offers multiple positions. A complete pilot and R2 figure are also included. Instructions are very well done and though all but color information is in Japanese, the drawings will be able to carry one through building the kit. Paints are referenced to the Gunze line. There are two sets of markings. Both for the same vehicle. The upper set shown are stickers while the lower are waterslide decals. The stickers will need to be cut out separately prior to use and while I'm sure most of you reading this will use the decals, it is nice to have the option. Both are superbly printed. So there you have it. The first of what I'm sure will be a series of 1/48 Star Wars models and an excellent place to start things. My thanks to www.hlj.com for the review kit. Get yours at Japanese prices.